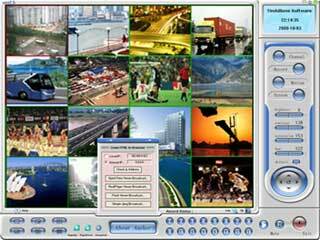 16-channel h264 remote video surveillance software for Windows. It can capture images up to 30 fps from USB and analog cameras,TV boards,capture cards,network ip camera etc. Broadcast live video to internet, and help you to create web page. It has an advanced video motion detection algorithm, various alert functions including Email,FTP,and sound. It uses H264 video encoder and AAC audio encoder, can record to MP4,MOV,AVI,FLV file. H264 WebCam Deluxe can encode your camera to H264 and AAC multimedia stream, and this stream can be viewed by Quicktime, Realplayer, IE browser on remote PC, Macintosh, Handset etc. H264 WebCam Deluxe also has a unique H264 User Name mode to manage dynamic ip address on the internet. High quality video and audio effects with low bandwidth needs and recording file formats include MP4, MOV, FLV, SWF or AVI. Manual recording is available, along with scheduled recordings as well as motion-triggered recording. JPEG image snapshots can be made from video images along with detailed log files. Qweas is providing links to H264 WebCam Deluxe 3.9 as a courtesy, and makes no representations regarding H264 WebCam Deluxe or any other applications or any information related thereto. Any questions, complaints or claims regarding this application H264 WebCam Deluxe 3.9 must be directed to the appropriate software vendor. You may click the publisher link of H264 WebCam Deluxe on the top of this page to get more details about the vendor.